If you've spent hours pouring over which mini split system to purchase, you won't want to skimp on the accessories. It's equally important to have all of the components needed for the installation as it is to get the best quality parts to ensure top performance. The video below will show how components go together to create a complete system. In this article, we will show and explain nearly every individual mini split accessory needed for installation. If you only need the essentials, then you may opt to purchase a pre-packaged kit that will save you time and money. A line set is a pair of copper tubes connecting your outdoor unit to your indoor unit. 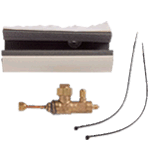 The line set allows refrigerant to flow between the two units and deliver or remove heat as needed. You will typically need one line set per indoor unit, but additional line sets will be required for systems requiring a branch box. 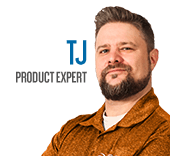 The size of the line set should typically match the size of the connections at the indoor unit, but you should always confirm by checking the installation manual or speaking with one of our experts before making a purchase. To determine the length of the line set, you will need to know the total distance between your indoor and outdoor units, including any turns and bends along the way. 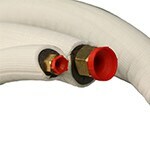 Our mini split line sets come pre-insulated and include flared ends and fittings to minimize installation time and cost. When a mini split is used for cooling operation, it will remove moisture from the air to lower the humidity. The moisture that is removed from the air condenses into liquid water and must be drained from the unit. The drain tubing provides a pathway for this water to leave the unit and flow to a suitable location. 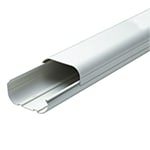 Many units use 5/8” flexible drain tubing, but some require either rigid drain tubing or a different size. Details about drain tube requirements can be found in the installation manual. In some situations, you may find that the line set required for your indoor unit does not match the port connections on your outdoor unit. 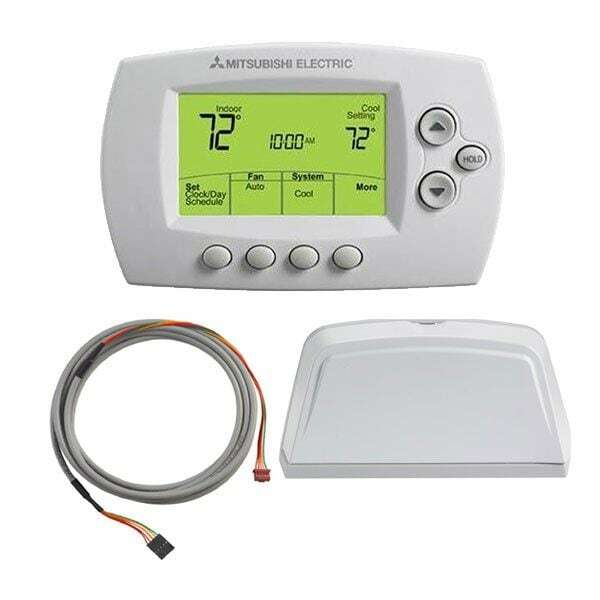 In these instances, it is important to use the manufacturer recommended line set and use an adapter to connect this line set to your unit. The size of the connection port on the unit will need to match the female connection size of the adapter and the line set size will need to match the male connection size of the adapter. Please contact one of our experts if you are unsure whether your application needs an adapter or which adapter it requires. All mini split systems require a dedicated circuit to supply power to the system. A disconnect box is required by code to be installed near the outdoor unit and allows for a technician to shut off power to the system when performing any service or repairs. 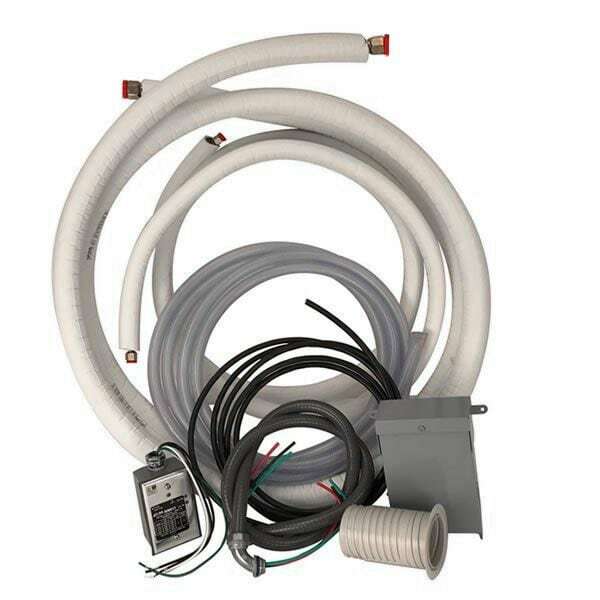 The whip is a flexible metal conduit that contains the wires necessary for connecting the disconnect box to the outdoor unit. Our standard whip and disconnect box kit works for the majority of the mini splits we offer. In addition to the line set, all mini split applications require a connecting cable. The connecting cable supplies power to the indoor units and provides a communication pathway between the indoor and outdoor units. For many of the systems we sell, a 14 gauge/4 conductor cable is recommended, but some manufacturers have different requirements (e.g. LG recommends 18 gauge/4 conductor cable for many of their units, and Samsung requires 2 cables, one 3-wire, and one 2-wire). 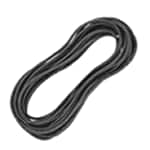 Like the line set requirements, the connecting wire requirements can usually be found in the mini split's installation manual. In some situations, it is either impractical or impossible to provide a drain line that allows water to drain solely by use of gravity. In these applications, a condensate pump can be used to remove the water and pump it to a suitable drain location. 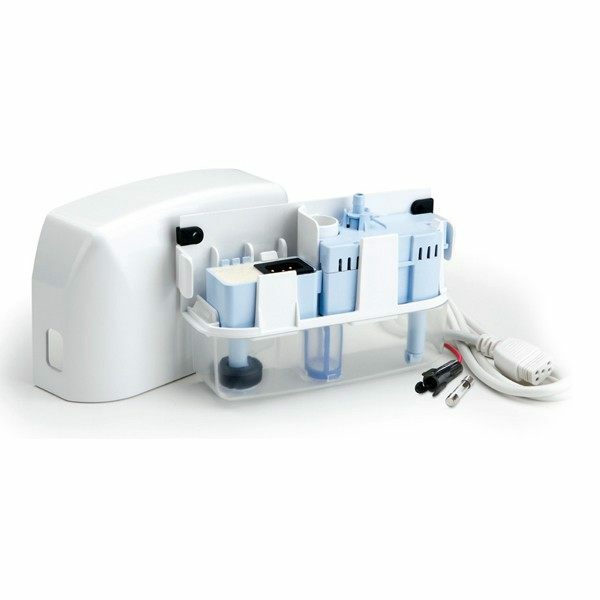 Condensate pumps are available for installation at a variety of locations, including in the unit, in a line set cover, below the unit, or in a convenient location away from the unit. 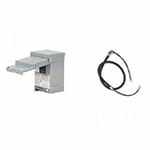 Rather than purchase the above accessories individually, we offer a standard mini split installation kit. 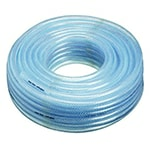 This kit includes a line set with matching lengths of 5/8" ID drain tubing and 14AWG/4 connecting cable. Also included is a whip, disconnect box, surge protector, and wall sleeve. If you require different specifications or additional components, you may need to purchase your accessories individually. The most common mounting option for a mini split outdoor unit is a condenser pad. Condenser pads are made from plastic or concrete-covered foam and provide a flat, stable surface on which to secure your outdoor unit. 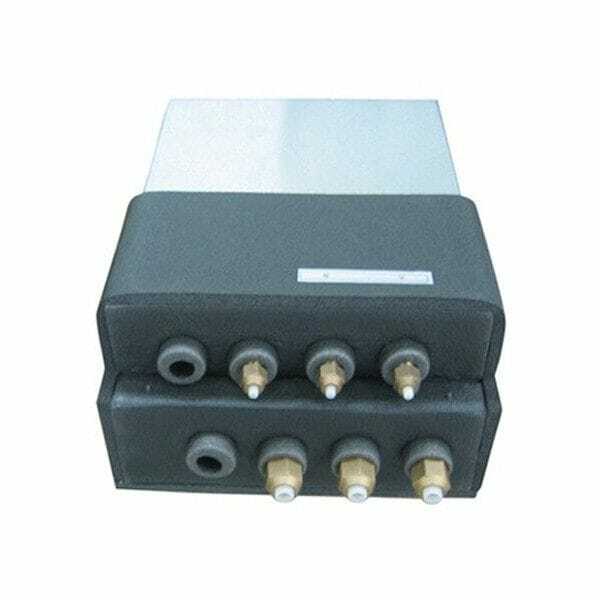 They will also reduce the vibration transmitted from the unit and reduce noise. In some applications, such as in areas with heavy snow or where the indoor units are on the second floor or higher, it is not practical to install the outdoor unit at ground level. A wall bracket can often be used to mount the outdoor unit at a suitable height from the ground. 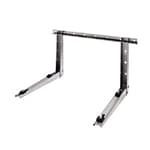 Wall brackets are available for a wide variety of system sizes and include vibration isolating mounts, which reduce noise transmission. Line set covers are a way to protect your line sets from wind, rain, sun, and animal damage. They secure to the wall of your home and snap around your line set to ensure simple and secure installation. Line set covers come in a variety of sizes to fit one or more line sets, and can be painted to match your home’s exterior. Some systems, primarily those using the eight zone capable condensers, require a branch box to supply refrigerant from the condenser to the indoor units. Branch boxes are manufacturer specific, and only certain branch box combinations are supported, so please contact our Product Advisers if you have any questions about selecting the appropriate branch box. Line set splitters are required for installations using two or more branch boxes. One splitter assembly is required for each branch box after the first. 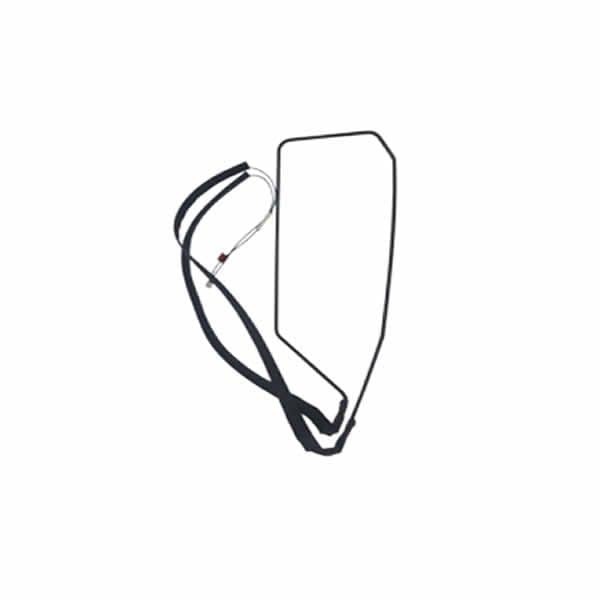 Like branch boxes, line set splitters are manufacturer specific. In addition to the controls included with nearly every mini split, there are a variety of optional controls available. These controls will often provide functionality that is otherwise unavailable, such as 7-day programmability, or integration with 3rd party control systems. Depending on the brand and model of your system, different options will be available, so please contact us to learn about control options available for your system. Drain pan heaters and wind baffles extend the operating range of mini splits into colder temperatures. These accessories are often used for applications where year-round cooling is required, or where the mini split is the only source of heat. Depending on the brand and model of the unit, low-ambient operation could be an on-site or factory option, so please contact us to make sure you get the right solution for your home. Accessories You Need to Install a Mini Split System - Mini Split Accessory Buying Guide. Our heating, ventilation and cooling equipment how-to library can help you pick the perfect comfort solution for your home.